This post was written by Ann Leonard, a client of mine. Thank you, Ann, for sharing this story. This is why I really love being an Animal Communicator – it’s a powerful way to help people and their animals resolve all sorts of problems. 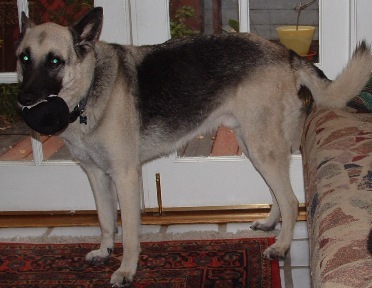 This summer (2011) my dog Chip, a German Shepherd, managed to get a foxtail logged in his left cheek. His face became swollen and he looked like he had the mumps. I took him to the vet and she opened the wound and said she hoped she had gotten it all out and gave him some medication to take. All went well until he finished the medication and then the cheek again became enlarged and painful. Chip with a favorite toy. Since the regular vet had not solved the problem, I was able to get in to see the holistic vet in very short order and took him there. Despite having been there many times and having no problems, Chip just went crazy when the vet tried to touch his face. Even a muzzle could not totally restrain him. We tried some holistic remedies at home but the swelling remained. This time I returned to the regular vet asking that the senior veterinarian deal with the problem. Again, Chip acted out as soon as anyone came near him and had to be sedated before he could be taken in for surgery. He came home with a drain in his cheek and a gigantic collar around his neck to keep him from aggravating the wound. Chip was not a very happy camper. As the time approached to have the drain removed, I was nervous about taking him back to the vets as I really didn’t want them to have to sedate him every time something needed to be done. So I called Nedda and we had a talk with Chip. It turned out that Chip was very angry at all the veterinarian staff because he felt that none of them had asked his permission to examine him nor had they explained to him in advance what they were going to do. He felt disrespected! He said he had been very worried about the wound and it was also quite painful. Nedda and I told Chip that we agreed with his concerns about how he had been treated, but that acting out was actually not good for him either. Then Nedda did a healing to help deal with the pain. In addition, Nedda suggested some flower essences to help restore his self-confidence and overcome his fears and anxieties. I was a nervous wreck the day I took Chip to have the drain removed, but Chip was wonderful. I told the nice tech about his concerns and she was very sympathetic and caring, asking his permission to treat him and telling him what was going to happen. In a relatively short time, Chip emerged without the drain and was very pleased with himself for his good behavior. When we returned a week or so later for a check-up and to have the collar removed, he was an angel once again, and all went well. 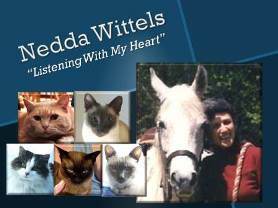 We are very grateful to Nedda for helping us get to the bottom of this problem. I no longer am concerned that Chip will be labeled a bad dog at the veterinarians. What a beautiful story. Powerful too that the solution turned out so very basic and simple. A little respect goes a long way.